The Audionics label is proud to come up with a new, comprehensive 10CD project, dedicated to Elvis’ legendary Las Vegas Summer ’74 season. 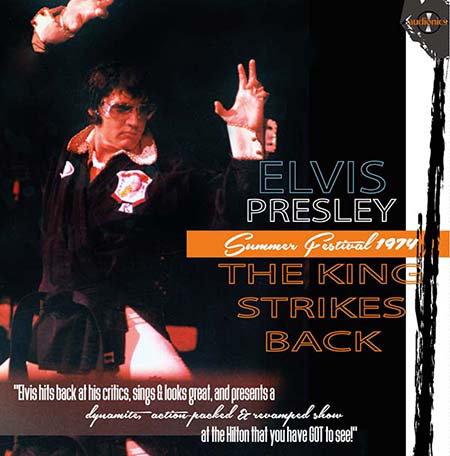 It is called „THE KING STRIKES BACK!“ and for the first time ever, all rehearsal and live soundboard recordings are presented in best possible sound quality and in one box! As you know, these recordings were released through the years by various bootleg labels and by the official collectors FTD label, too. Nevertheless, many of these original releases are hard to find nowadays, including several already deleted FTD CDs! For some of these recordings we have used audio tapes (master cassettes) as a source, rather than existing CD releases. We have spent dozens of hours in studio, to restore and enhance them. As usual, every recording was treated individually and restored from scratch, using today's advanced technology to achieve the best possible sound quality for your optimal listening pleasure. This is the first-ever Audionics comprehensive box. It’s a special set which deserves a place in any serious Elvis collection! Audionics is planning new CD releases in 2018, and additionally, this label will be releasing several special vinyl projects! So stay tuned! 01. If You Love Me (Let Me Know) #1- 02. If You Love Me (Let Me Know) #2 - 03. Promised Land #1- 04. Promised Land #2 - 05. Down In The Alley #1 - 06. Down In The Alley #2 - 07. It's Midnight - 08. Your Love's Been A Long Time Coming - 09. Good Time Charlie's Got The Blues - 10. Softly As I Leave You #1 (with Sherrill Nielsen) - 11. Softly As I Leave You #2 (with Sherrill Nielsen) - 12. I'm Leavin' - 13. The First Time Ever I Saw Your Face - 14. Proud Mary - 15. If You Talk In Your Sleep - 16. If You Love Me (Let Me Know) #3- 17. If You Love Me (Let Me Know) #4. 01. The Twelfth Of Never - 02. Faded Love - 03. Just Pretend. 04. If You Love Me (Let Me Know) #1 (previously unreleased version) - 05. Promised Land -06. Down In The Alley - 07. It's Midnight - 08. Your Love's Been A Long Time Coming 09. Good Time Charlie's Got The Blues - 10. Softly As I Leave You (with Sherrill Nielsen) - 11. I'm Leavin' - 12. Proud Mary 13. If You Talk In Your Sleep - 14. If You Love Me (Let Me Know) #2 - 15. If You Love Me (Let Me Know) #3 - 16. The Twelfth Of Never - 17. Faded Love - 18. Just Pretend. 19. The Twelfth Of Never (1995 original single version) - 20. The Twelfth Of Never (1994 version overdubbed by David Briggs). 01. Opening Vamp / Big Boss Man - 02. Proud Mary - 03. Down In The Alley - 04. Good Time Charlie's Got The Blues - 05. Never Been To Spain - 06. It's Midnight - 07. If You Talk In Your Sleep - 08. I'm Leavin' - 09. Let Me Be There (with reprise) - 10. Softly As I Leave You (with Sherrill Nielsen) - 11. If You Love Me (Let Me Know) - 12. Love Me Tender - 13. Polk Salad Annie - 14. Introductions of singers, musicians, orchestra - 15. Introduction of Gunther Gebel-Williams - 16. Promised Land - 17. Introduction of Telly Savalas - 18. My Baby Left Me - 19. Bridge Over Troubled Water - 20. Fever - 21. Hound Dog - 22. Can't Help Falling In Love (incomplete). 01. Opening Vamp / C. C. Rider - 02. I Got A Woman / Amen - 03. Love Me - 04. If You Love Me (Let Me Know) - 05. It's Midnight - 06. Proud Mary - 07. Trying To Get To You - 08. Big Boss Man (incomplete) - 09. Fever - 10. Promised Land - 11. Love Me Tender - 12. All Shook Up - 13. I'm Leavin' - 14. Softly As I Leave You (with Sherrill Nielsen) - 15. Hound Dog - 16. You Gave Me A Mountain - 17. Polk Salad Annie - 18. Introductions of singers, musicians, orchestra - 19. If You Talk In Your Sleep - 20. Why Me Lord - 21. (Let Me Be Your) Teddy Bear / Don't Be Cruel (incomplete) - 22. Hawaiian Wedding Song (incomplete) - 23. Let Me Be There - 24. Can't Help Falling In Love - 25. Closing Vamp. 01. Opening Vamp / C. C. Rider - 02. I Got A Woman / Amen - 03. Love Me - 04. If You Love Me (Let Me Know) - 05. It's Midnight - 06. Big Boss Man - 07. Fever - 08. Trying To Get To You - 09. Love Me Tender - 10. All Shook Up - 11. I'm Leavin' - 12. Softly As I Leave You (with Sherrill Nielsen) - 13. Hound Dog - 14. You Gave Me A Mountain - 15. Polk Salad Annie - 16. Introductions of singers, musicians, orchestra (incomplete) - 17. Introduction of Freddy Cannon / Higher & Higher (one line) / Introducion of Jackie Wilson - 18. If You Talk In Your Sleep - 19. Why Me Lord - 20. (Let Me Be Your) Teddy Bear / Don't Be Cruel - 21. Heartbreak Hotel - 22. Bridge Over Troubled Water - 23. Hawaiian Wedding Song - 24. Let Me Be There (with reprise) - 25. Can't Help Falling In Love - 26. Closing Vamp. 01. Opening Vamp / C. C. Rider - 02. I Got A Woman / Amen - 03. Love Me - 04. If You Love Me (Let Me Know) - 05. It's Midnight - 06. Big Boss Man - 07. Fever - 08. Love Me Tender - 09. All Shook Up - 10. Dialogue / Stop The World (And Let Me Off) (one line) - 11. I'm Leavin' - 12. Softly As I Leave You (with Sherrill Nielsen) - 13. Hound Dog - 14. You Gave Me A Mountain - 15. Polk Salad Annie - 16. Introductions of singers, musicians, orchestra / Take These Chains From My Heart (one line) - 17. If You Talk In Your Sleep - 18. Why Me Lord - 19. (Let Me Be Your) Teddy Bear / Don't Be Cruel - 20. Hawaiian Wedding Song - 21. The First Time Ever I Saw Your Face - 22. Let Me Be There (with reprise) - 23. Can't Help Falling In Love - 24. Closing Vamp. 25. Suspicious Minds / The Blue Danube (An der schönen blauen Donau, excerpt)- 26. Help Me (with Sherrill Nielsen). 18. If You Talk In Your Sleep. 19. The Wonder Of You - 20. An American Trilogy - 21. Monologue / We Shall Overcome (excerpt) - 22. Hawaiian Wedding Song - 23. Monologue - 24. It's Now Or Never. 01. Help Me - 02. My Boy - 03. How Great Thou Art. 04. Why Me Lord? - 05. (Let Me Be Your) Teddy Bear / Don't Be Cruel - 06. How Great Thou Art - 07. Let Me Be There (with reprise) - 08. Introductions of singers, musicians, orchestra - 09. Early Morning Rain - 10. Hawaiian Wedding Song - 11. Can't Help Falling In Love / Closing Vamp (incomplete). 12. Opening Vamp / C. C Rider - 13. I Got A Woman / Amen - 14. Love Me - 15. If You Love Me (Let Me Know) - 16. It's Midnight - 17. Big Boss Man - 18. Fever - 19. All Shook Up - 20. Softly As I Leave You (with Sherrill Nielsen) - 21. Hound Dog - 22. An American Trilogy - 23. Introduction of Dean Nichopoulos - 24. Suspicious Minds. 01. Introductions of singers, musicians, orchestra - 02. Monologue (about karate) - 03. If You Talk In Your Sleep - 04. Dialogue (about karate) - 05. Introduction of Kang Rhee - 06. Help Me - 07. Let Me Be There (with reprise) - 08. How Great Thour Art (with reprise) - 09. Hawaiian Wedding Song - 10. You Gave Me A Mountain - 11. Can't Help Falling In Love / Closing Vamp (incomplete). 12. Microphone Dialogue - 13. I Got a Woman / Amen - 14. Dialogue (about karate) - 15. Until It's Time For You To Go - 16. If You Love Me (Let Me Know) - 17. It's Midnight - 18. Big Boss Man - 19. You Gave Me a Mountain. 01. Dialogue (about Priscilla) - 02.Softly As I Leave You (with Sherrill Nielsen) - 03. Hound Dog - 04. An American Trilogy - 05. It's Now Or Never #1 - 06. Introductions of singers, musicians, orchestra - 07. Guitar Solo (James Burton) - 08. Drum Solo (Ronnie Tutt) - 09. Bass Solo (Duke Bardwell) - 10. Piano Solo (Glen D Hardin) - 11. I Couldn't Live Without You (Voice) - 12. Bringing It Back (Voice) - 13. Aubrey (with Voice) - 14. Introduction of Vikki Carr, Bill Cosby - 15. It's Now Or Never #2 - 16. Let Me Be There (with reprise) - 17. If You Talk In Your Sleep - 18. Monologue (about drug rumours) - 19. Hawaiian Wedding Song - 20. Dialogue (about jewelry) - 21. Can't Help Falling In Love - 22. Closing Vamp.